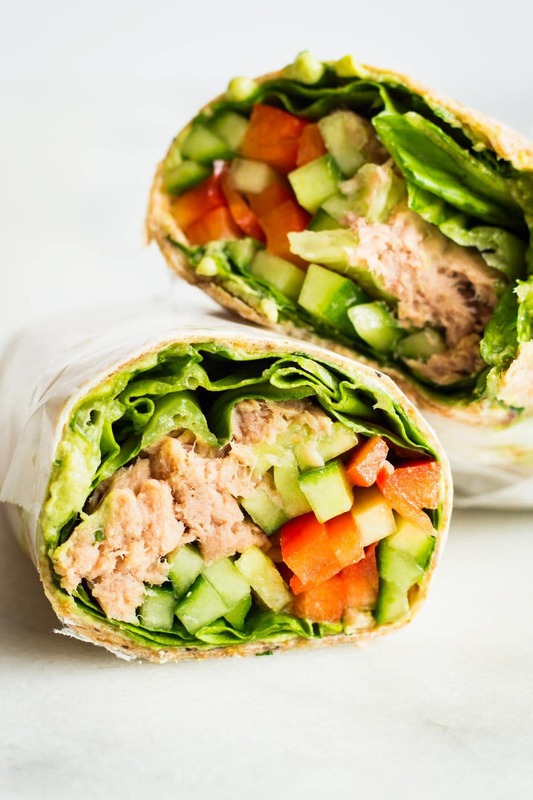 A tuna wrap is a convenient, grab-n-go healthy lunch, created especially with busy people in mind. 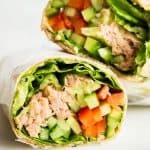 With tuna, crunchy veggies, and a delicious avocado tahini dip for sauce, this healthy tuna wrap is ready in 10 minutes! When you don’t have time to prepare a big lunch, and you have to use up all those leftovers going sad in the fridge, a wrap is a perfect solution. Wraps are quick and easy to prepare, leave almost no mess in the kitchen, and are easy for kids to eat on the go. This 10-Minute Tuna Wrap is probably my favorite empty-out-the-fridge meal, followed by this Healthy Chicken Wrap. Considering the wrap can be made with just about any protein why is this tuna wrap my favorite? Apart from the fact that it only takes 10 minutes to make, I love the texture combination. There’s soft, flaky tuna in the middle with crunchy veggies and lettuce surrounding it. 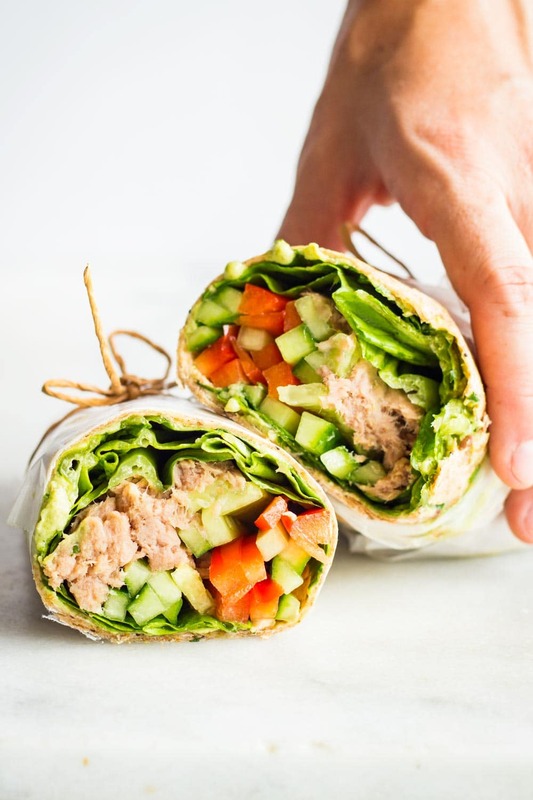 All of that healthy goodness is wrapped up into a soft whole wheat tortilla that’s been brushed with creamy avocado tahini dip. What’s not to love about that? Besides, there is always at the very least 1 can of tuna sitting in my pantry at all times. All I have to do is open the can. No need to cook anything. How do you make a tuna wrap? 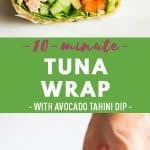 In my opinion, using the flavourful avocado tahini dip on the inside of the tuna wraps is a must. It’s what makes any leftover in the fridge shine even when it’s already pretty sad, lol. The most important is to spread out the dip just in the center of the tortilla. Just as the rest of the filling, lay it out just in the center, that way it’s much easier to roll it up. To roll it up, start rolling it as tightly as you can without ripping the tortilla, then flap in the sides, then continue rolling. That keeps the filling nicely inside the tuna wrap without anything falling out. Bonus tip: make sure your wraps have been at room temperature for a while. Fridge cold tortillas rip very easily. How many calories is a tuna wrap? Calories and other nutritional information can be seen in the recipe below. Keep in mind, however, that depending on the type of wrap and how much tahini dip you use, the nutrition may vary. The calorie count will be somewhere close to 340. Wash and thinly slice cucumber and bell pepper. Place whole wheat tortilla on top. Spread Avocado Tahini Dip on half of the tortilla. Place lettuce, tuna, cucumber and bell pepper on dip. Roll everything into a wrap, then roll around wax paper forming pockets at top and bottom and secure with either adhesive tape or a string. Cut in the middle and enjoy! Lorena, I agree with you that everyone has a different opinion of what healthy is. And a lot of recipes can be modified too. What can I use in place of the sesame oil in this recipe? Tried it and it was amazing, definitely going to keep this recipe close. This is such an healthy and easy wrap for lunch! Thanks for sharing such a delicious recipe, full of healthy fat and lean protein. This is a great one ! This is my kind of meal! Healthy indeed! How can this be considered healthy in any way. The sodium level in the nutrition content is wrong. The sodium level of a single wheat tortilla is around 290 and then the sodium level of the tuna alone is around 525. This does not include any sodium from the dip either. That’s over 900mg of sodium in 1 serving. That is more than half your daily sodium intake in 1 meal. Hi Frankie, I am saddened that you have rated my recipe with 1 star without even having tried it. The star-rating is considered a rating of the recipe not a matter of opinion. The cans of tuna that I buy have 133g drained weight and only 190 mg sodium listed in the nutritional information. I don’t know where you get your tuna from but you should certainly choose a different brand if yours has 525 mg. And the organic whole wheat tortillas I buy have 190 mg sodium per tortilla. As a dip you can use whatever low-sodium dip you want. I make my own which has the exact right amount of sodium for ME. I am a marathon runner so I make sure I consume enough salt. “Healthy” means something different for everybody. 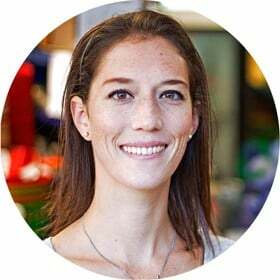 My healthy might not be yours, and yours might not be mine. I don’t judge your understanding of healthy with star-ratings. You are genius for making a food in less time. Thanks for all your dishes but it is best one. do you have to use cooked tune or will just a can of regualr wet tuna work?